JLF Moving Solutions are a friendly family run removals company based in Cannock, Staffordshire. 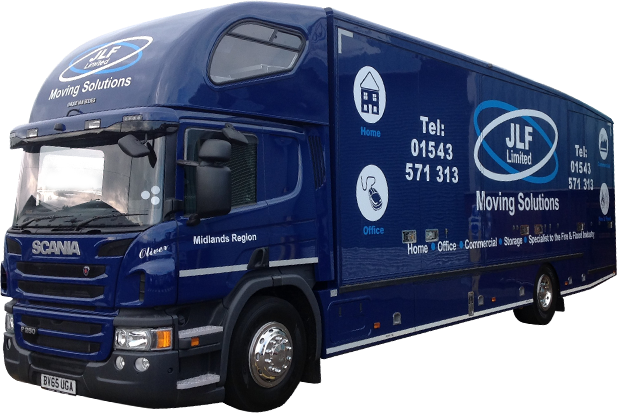 Strategically located within the Midlands, JLF Moving Solutions provide removal services throughout the UK. We have over 30 years of experience in the industry and cover every aspect of a stress free move. For all your removal requirements we provide an efficient, hassle free professional removals service anywhere in the UK at very competitive prices. Our staff have over 30 years experience in the removal and storage industry. Over the years we have carried out work for Government projects, Banks, Public Houses and large industrial organisations. We offer a first class efficient and dependable service. We use professional wooden lockable crates at our containerised storage depots, which is inventoried and secured. All containers are then taken back to one of our secure storage depots where it is secured by 24 hour monitored security system. All of our premises are fully maintained and regularly checked with our fire maintenance contractors. Your treasured possessions are all fully insured for peace of mind. Copyright © 2019, JLF Moving Solutions Ltd.
Powered by On2net (UK) Ltd.